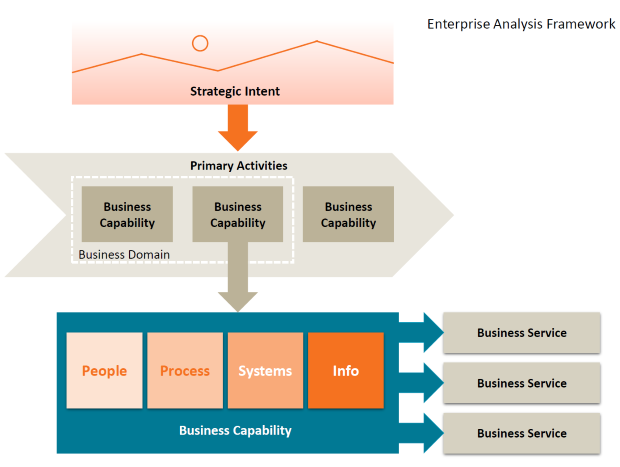 This post continues from the post Enterprise Analysis - Using Business Architecture to Clarify the Muddle (Part 1). The picture below shows how the high level view of the business connects with the elements that may be changed to improve the business performance. This view allows the analyst to connect the requirements for change with the business itself and present a context for the change that is required. It allows people to start talking about what they know - the business. One General Manager described this kind of view as lowering the barrier of participation…it encouraged the different stakeholders to engage in the project. Earlier this month I delivered an IIBA presentation, with the same title 'Enterprise analysis - using business architecture to clarify the muddle', to around 80 attendees in Wellington, New Zealand. The presentation was well received. This post, plus the Part 2 post to follow, summarise some of the key points from the presentation. Business change is complex – as we undertake requirements at a project level we realise that we need to understand people, processes, information and rules. We realise that processes cross departmental boundaries and people will have to change work habits. The discoveries go on and on adding to the complexity of a change initiative. Lately, together with some of my business analyst colleagues, I have developed a strong interest in the disciplines of Business Architecture and Enterprise Analysis. I have seen it as a powerful vehicle for providing context to projects and programs of work, helping management make investment decisions and mapping change onto their various organisational units.